* Some United States chemical associations recognize only 13 vitamins. However, the International Union of Pure and Applied Chemistry (from the International Union of Biochemistry) has identified 19 vitamins, and the Japanese Vitamin Academic Society has identified 17 vitamins. ** Vitamin P and Vitamin Fare considered citrus bioflavonoids and essential unsaturated fatty acids, respectively. Vitamin Bl2 is generally believed to come only from animal sources; however, independent analyses from Irvine Analytical Laboratories, as well as from the Resource Research Association, Office of Science and Technology, and Japan Food Analysis Center, indicate that green barley leaves contain B12. *** There is not a standard method to analyze enzyme activities. Superoxide dismutase (SOD) has been used to measure enzyme activities. 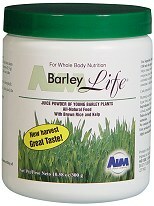 Lab analyses indicate that green barley extract contains active SOD. The presence of active SOD in green barley extract may indicate that other common green grass enzymes are found in active conditions. The best and most complete analysis of Barleygreen can be found in a book written by the inventor Dr. Yoshihide Hagiwara, M.D.. The Unabridged version is about 140 pages and is very detailed. The abridged version is pretty good and may have enough detail for you. It just depends how much detail you are interested in. We highly recommend his book over a simple list of nutrients as these can be misleading. Another good book including a number of testimonials is Green Leaves of Barley by Dr. Mary Ruth Swope.